Homs has always been one of the strongholds of the Syrian opposition. In 1982, when Father Assad ordered his brother Rifaat to deal with the opposition the city was destroyed at large, leaving at least 10,000 dead people to one account but 40,000 to another one. In 2011, the country experienced many uprisings against Bashar Assad and his authoritarian regime. While people demanded their democratic rights, the regime did not hesitate to use violence against opposition and civilians ruthlessly. According to Fearon’s and Feldmann’s quantative approach, the conflict between the regime and opposition already amounted to the level of civil war. The relationship between the civil war and Homs is that the city was crushed again recently by the regime as it was home to many rebellion groups. 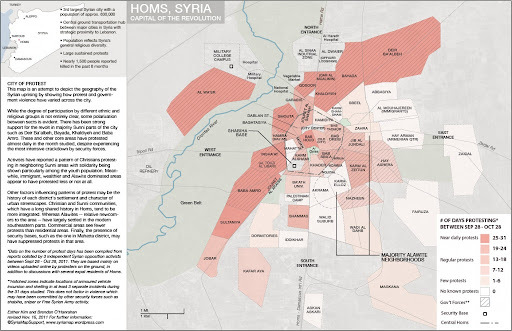 A map prepared by some observersmade me think about both the population distribution in the city and why the opposition could not come together against Bashar Assad. While the Sunnis have historically been the majority in the city and therefore leading the opposition, the Nusayris(Syrian Alawites- I find the term Alawite a constructed one as it came to use only in the 20th century) seem to be less. The below map also shows us that the population is segregated along sectarian lines but that doesn’t necessarily mean the Nusayris are not supporting the uprisings. However, nobody knows how many Nusayris joined the uprisings and how many of them still support Assad. As our knowledge on what is going on in the field is little, one cannot answer why the protests are more in some neighborhoods and few in some others. But it is this nature of the conflict in Syria that makes it unique compared to other awakening movements in the Middle East and North Africa. Also, one should mention how the opposition groups are divided not only along sectarian lines but also ideologically. For example, the Kurds refused to be part of the Syrian National Council as they demanded an autonomous Kurdish government within Syria. One last word should be said on the strength of the Syrian state. Historically, the state apparatus co-opted the opposition and different sectors of the country to empower itself. While many claim that Syria is weakened by sanctions, the state managed to be powerful not only through security apparatus but also by developing sophisticated policies to be central to Syrian people’s minds. Therefore, the Assad regime enjoyed this phenomenon in addition to the regional and international power struggles that made an intervention to Syria difficult to undertake.